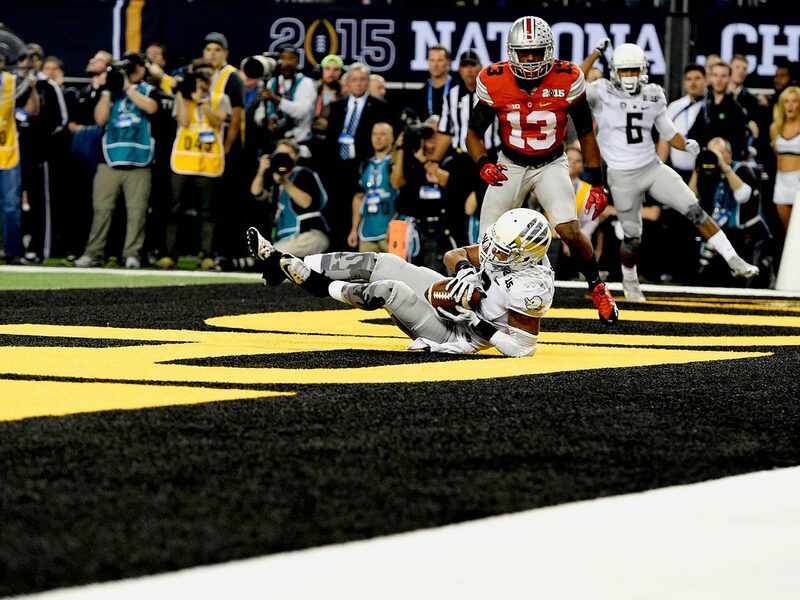 Ohio State beat Oregon 42-20 to win the college football national championship. Running back Ezekiel Elliott shined for the third straight game, racking up 246 yards and four touchdowns. ARLINGTON, Texas -- The first season of the College Football Playoff era is in the books, and Ohio State reigns supreme. 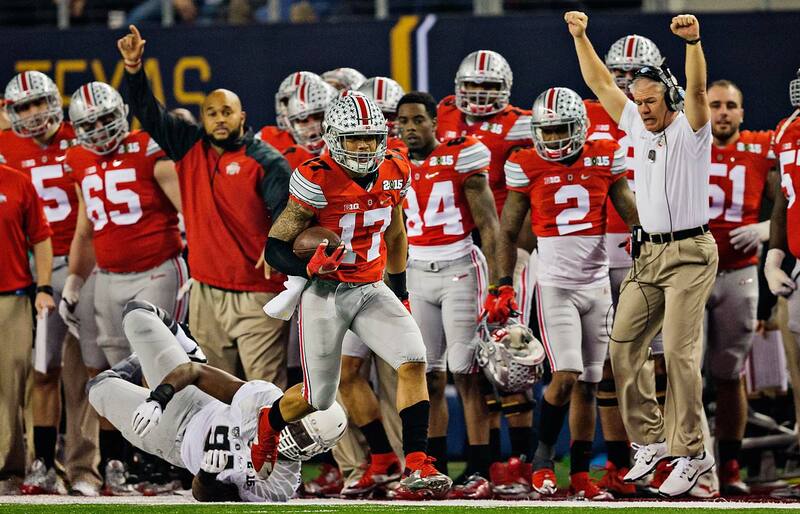 The Buckeyes beat Oregon 42-20 on Monday night to capture the program’s first national title since 2002. This Ohio State group was left for dead following a 35-21 loss to Virginia Tech on Sept. 6 but rattled off 13 consecutive wins, all behind its second- and third-string quarterbacks. 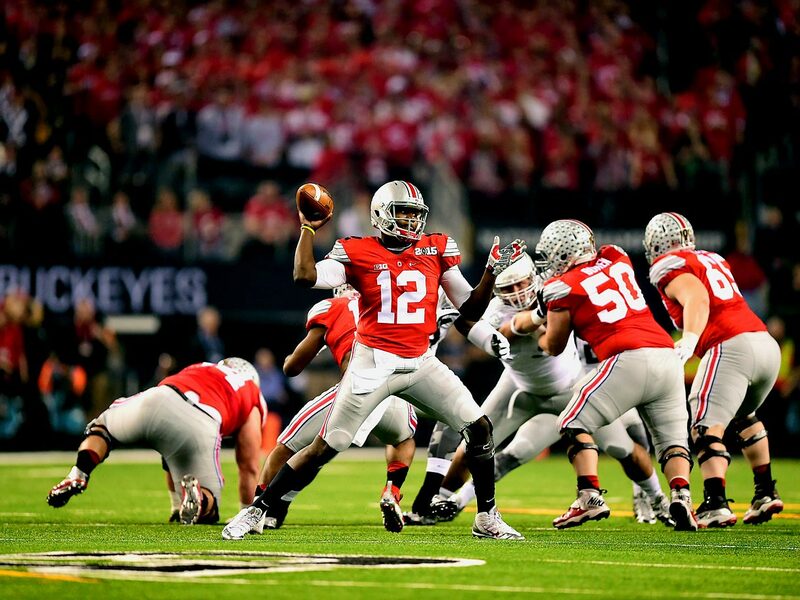 Here are three thoughts on the Buckeyes’ triumph. 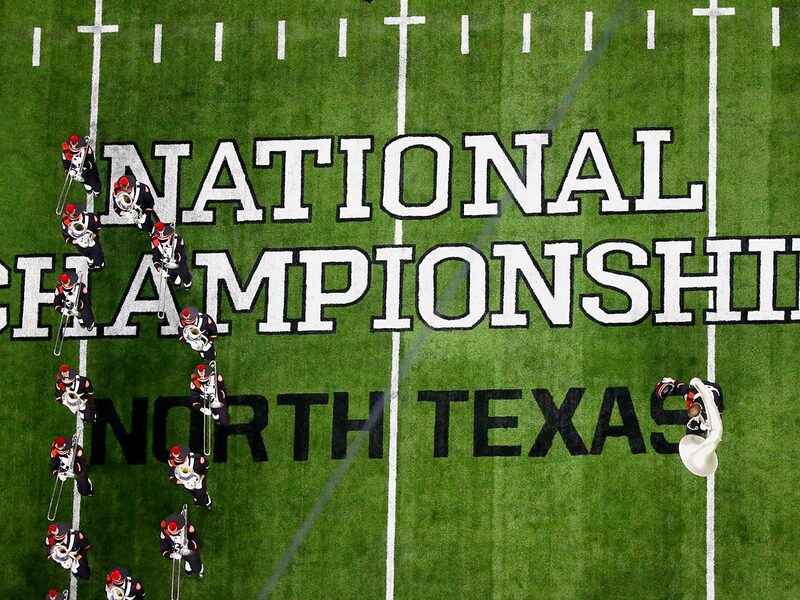 • ELLIS: Title game winners, losers: Who flourished? Who faltered? Few things would have seemed more unlikely in early September than a Buckeyes national championship. Heisman Trophy hopeful Braxton Miller had been lost for the season with a shoulder injury. The Buckeyes fell to Virginia Tech at home to seemingly drop out of playoff contention. Ohio State was young and unproven and didn’t even appear to be the premier team in its own conference. That distinction belonged to Michigan State, which upended the Buckeyes in the 2013 Big Ten title game. But then Ohio State grew up. It hung 50 points in victories over Cincinnati, Maryland and Rutgers. It skated by Penn State and rolled past Michigan State. As the season neared its conclusion, the Buckeyes elevated things to an entirely new level: wins over Wisconsin, Alabama and Oregon in succession, all games in which they were listed as the underdogs. Of course, there’s the quarterback storyline. Miller went down, and then J.T. Barrett went down against Michigan, and then 6-foot-5, 250-pound Cardale Jones stepped in and led the program to glory. He was certainly impressive Monday, going 16 of 23 for 242 yards with a touchdown and an interception. He also rushed 21 times for 38 yards with a score. Jones was at his best on third-and-long situations, including a 45-yard completion to Devin Smith in the second quarter. Tailback Ezekiel Elliott was brilliant, and the Buckeyes’ defensive line lived up to the hype. Formerly lesser-known players from linebacker Darron Lee to all-purpose dynamo Jalin Marshall to offensive guard Pat Elfein also played important roles. Perhaps it’s only fitting: In the most unusual of statistics, Ohio State lost the turnover battle four to one (with Oregon’s lone turnover coming on the game’s meaningless final play) and still won by 22 points. These Buckeyes may not have been the most heralded, but they were the most resilient, and now they are champions. Elliott was relatively quiet early in the season, combining for 141 yards over the Buckeyes’ first three games. But, boy, did he ever turn it on when it mattered most: The running back raced for 220 yards with two touchdowns against Wisconsin, 230 yards with two touchdowns against Alabama and 246 yards with four scores against Oregon. After Barrett went down with a fractured ankle, Elliott morphed into a virtual superhero. He generated most of his yardage behind a steady diet of counters and inside zones but found ways to succeed even when facing congestion at the level of Times Square on New Year’s Eve. That was never more evident than on Ohio State’s 12-play drive to close out the third quarter. Elliott carried six times, picked up three first downs and rumbled into the end zone from nine yards out. The sophomore from St. Louis will enter the 2015 season with plenty of Heisman hype, and deservedly so. The Ducks’ recent ascent in the college football universe has been nothing short of remarkable. Over the past decade, Oregon has transformed from a middle-of-the-Pac-10 program into a regular threat to win the national title. But this season felt like its best chance to claim the sport’s biggest prize. It couldn’t capitalize. Quarterback Marcus Mariota, the Heisman winner and the undisputed greatest player in program history, is expected to declare for the 2015 NFL draft. Senior cornerback Ifo Ekpre-Olomu will graduate (he missed the title game after injuring his knee before Christmas), as will center Hroniss Grasu and linebacker Tony Washington. For Oregon, all the pieces were in place this year. But it still didn’t happen. Make no mistake, the Ducks should remain a West Coast power in the years to come. Given their branding, tempo and up-and-coming head coach (Mark Helfrich), they should continue to make their mark on the national landscape. But if there was ever a moment that seemed ripe for Oregon’s transcendence, it was this one. Only it was the Buckeyes rejoicing with the trophy Monday night. 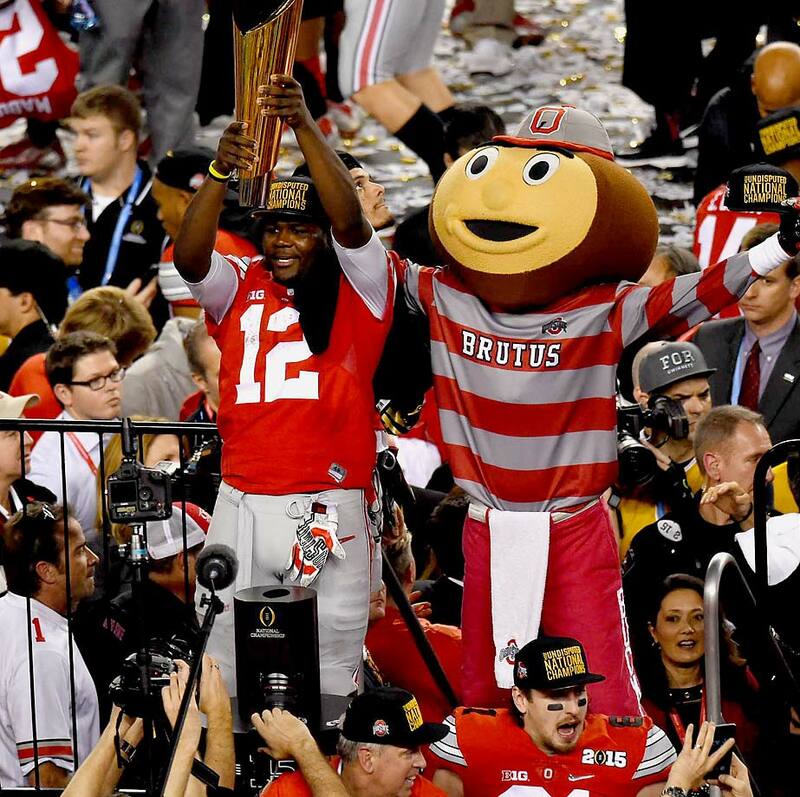 Ohio State quarterback Cardale Jones celebrates with the Buckeyes' mascot after his team's 42-20 win over Oregon in the National Championship game at AT&T Stadium in Arlington, Texas, Jan. 12, 2015. Ohio State wide receiver Kato Mitchell celebrates with his teammates after the Buckeyes' 42-20 win over Oregon. 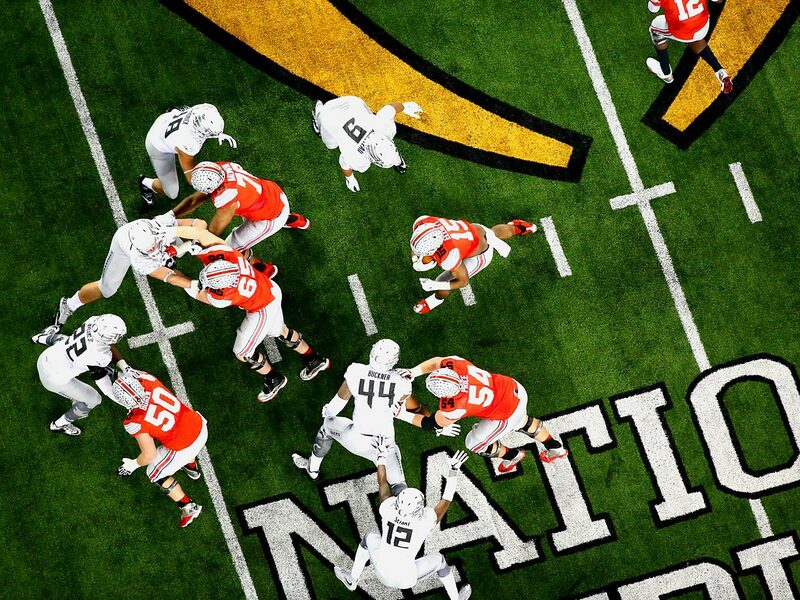 Ohio State's Jeff Heuerman (5), Nick Vannett (81) and Marcus Baugh (85) whoop it up at the national title game. 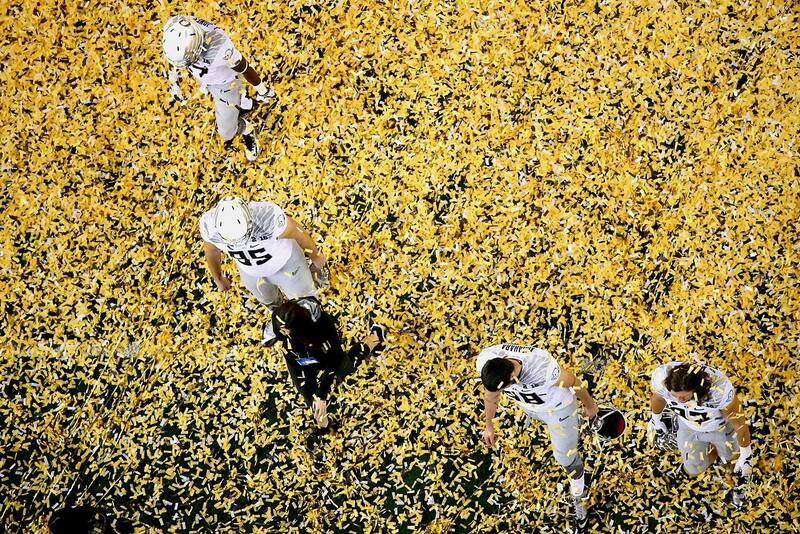 Oregon Ducks players and coaches walk off the field as the confetti falls in the wake of their 42-20 defeat at the hands of Ohio State. 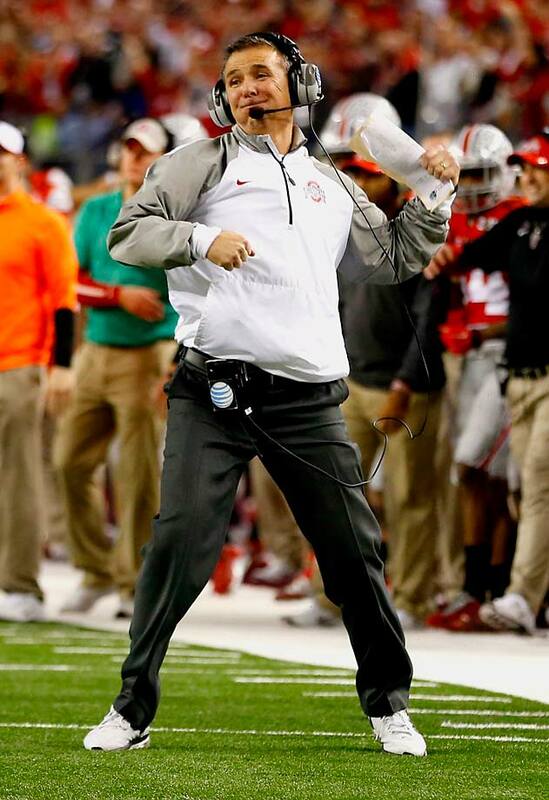 Ohio State Buckeyes coach Urban Meyer fist pumps during his team's 42-20 win over the Oregon Ducks. An Ohio State receiver catches the ball behind the back of an Oregon Ducks cornerback at AT&T Stadium in Arlington, Texas. 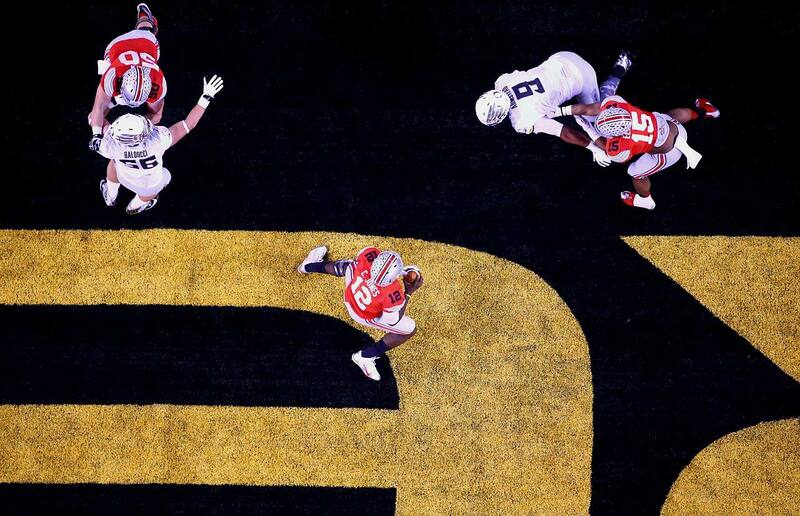 Ohio State running back Ezekiel Elliott runs over two Oregon Ducks for one of his four touchdowns. Ezekiel Elliott celebrates with teammate Corey Smith after one of his four touchdowns. Oregon quarterback Marcus Mariota tries to stiff arm Ohio State linebacker Michael Bennett (53). Ohio State receiver Jalin Marshall evades an Oregon defender along the sideline. Ohio State quarterback Cardale Jones drops back to throw. Jones finished with 242 yards against the Oregon Ducks in the Buckeyes' 42-20 win. Ohio State wide receiver Devin Smith attempts a catch over Oregon cornerback Reggie Daniels. Oregon was called for pass interference on this play in the end zone. Ohio State tight end Nick Vannett goes to the ground after his touchdown catch in the first half. Ohio State safety Tyvis Powell stops Oregon running back Thomas Tyner short of the goal line in the Buckeyes' 42-20 win. Oregon wide receiver Charles Nelson rises for a catch between two Ohio State defenders. 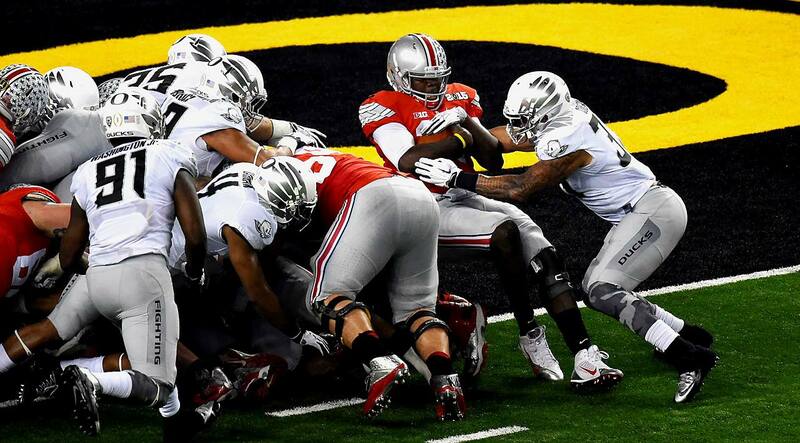 Ohio State quarterback Cardale Jones stumbles in his own end zone as the Oregon defense pursues him. Jones avoided a safety on the play. 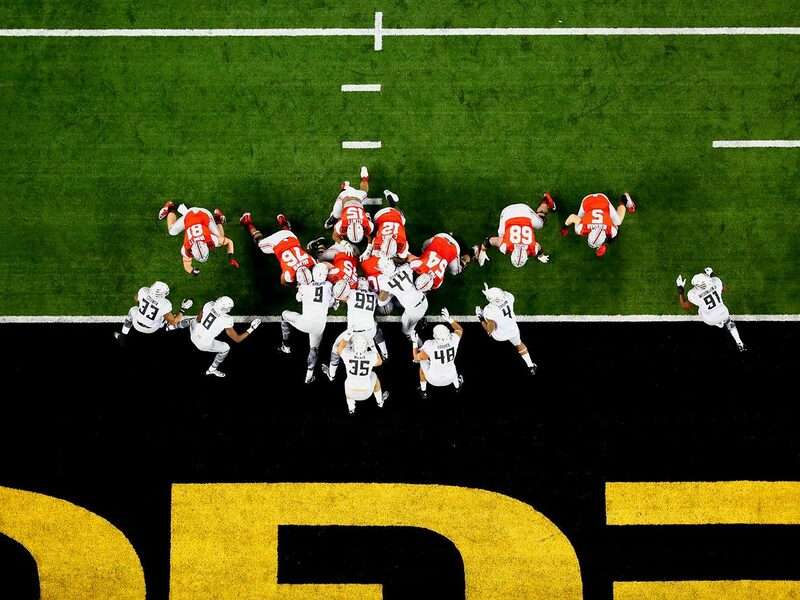 Ohio State quarterback Cardale Jones spun out of a tackle and bulled his way in for a touchdown on this play. Replay officials took a close look to see if Byron Marshall let the ball go before he crossed the goal line on this play. Byron Marshall could have cost his team a touchdown had he celebrated by dropping the ball too early. Ohio State quarterback Cardale Jones prepares to throw in the face of three Oregon defensive linemen. Jones completed 16 of his 23 passes during the Buckeyes' 42-20 win. 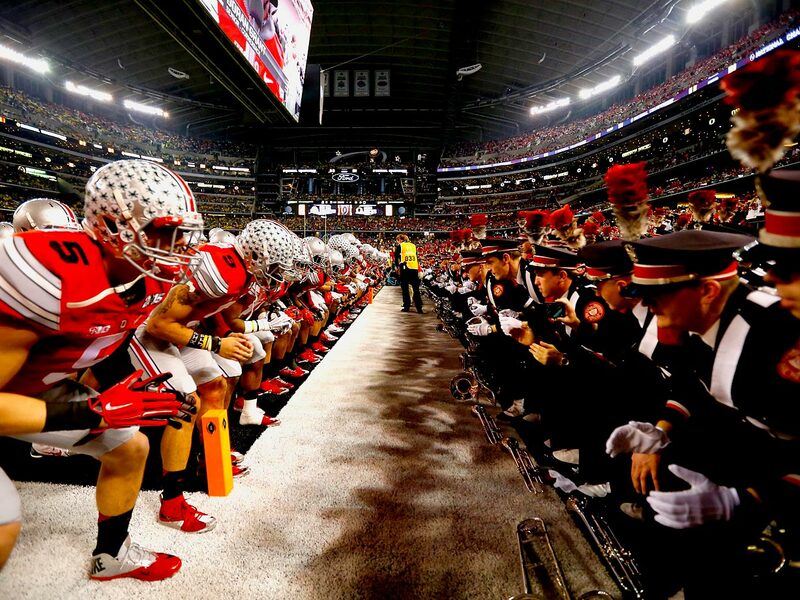 Ohio State lines up for a quarterback sneak at the one-yard line against the Oregon defense. 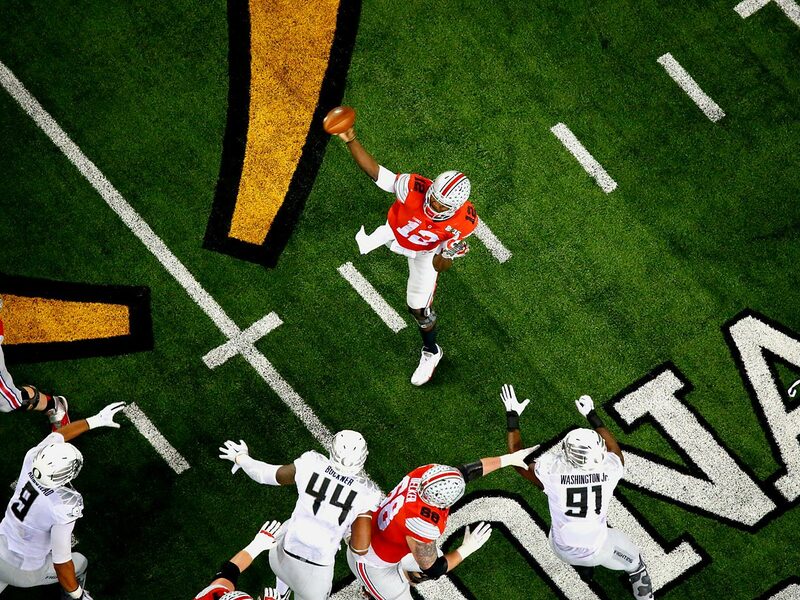 Ohio State quarterback Cardale Jones leaps over two Oregon defenders. Jones ran for 38 yards on 21 carries in the Buckeyes' 42-20 win. Ohio State running back Ezekiel Elliott ran for over 200 yards in all three games that Cardale Jones started at QB for the Buckeyes. 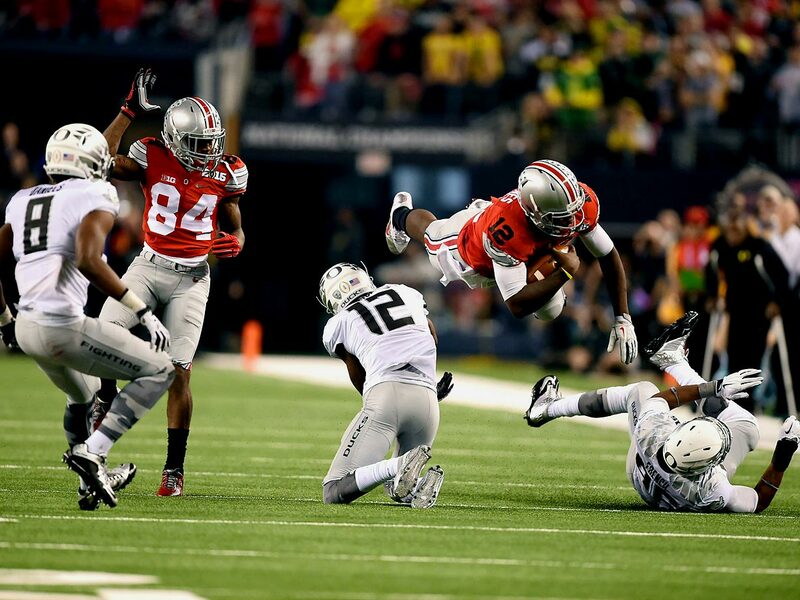 Ezekiel Elliott evades an Oregon defender -- something he did all night. 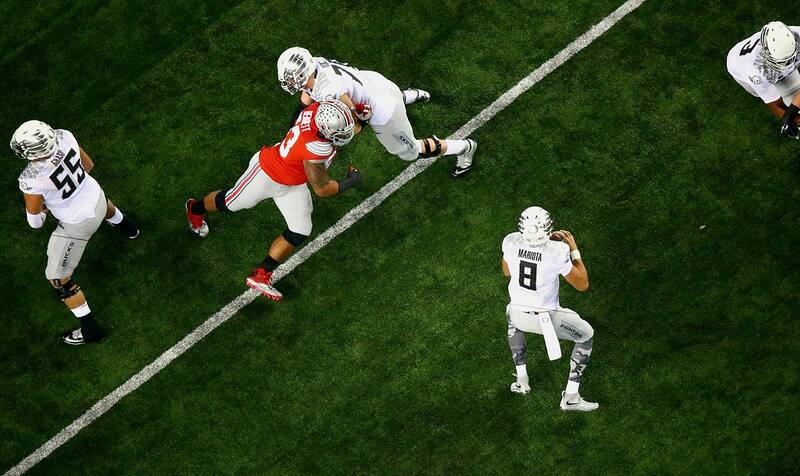 Oregon quarterback Marcus Mariota tries to evade Ohio State defensive lineman Adolphus Washington. Mariota threw for 333 yards in the Ducks' loss. Ohio State quarterback Cardale Jones throws from his own end zone during the Buckeyes' 42-20 win. Oregon quarterback Marcus Mariota drops back to pass. Mariota combined for 372 yards in the air and on the ground. 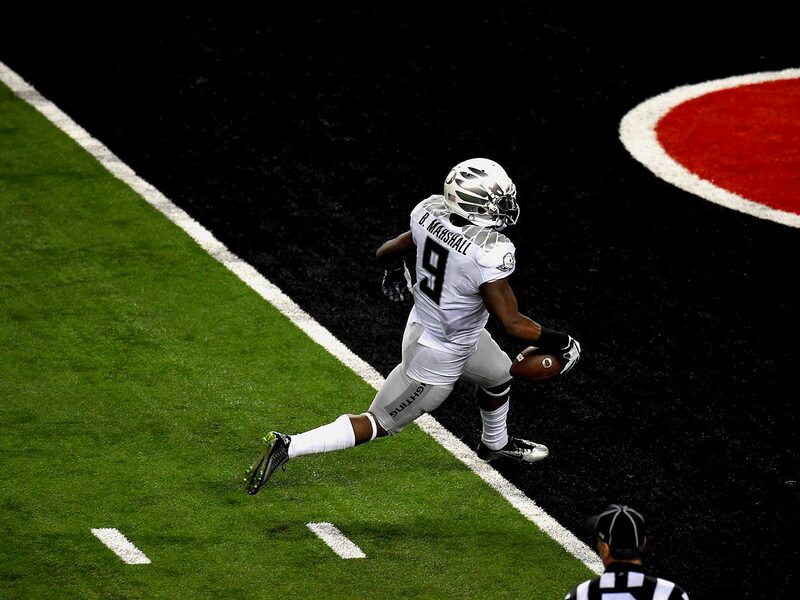 Oregon wide receiver Keanon Lowe catches a touchdown pass for the first score in the National Championship game. Keanon Lowe's touchdown gave the Ducks false hopes that this would be their night. 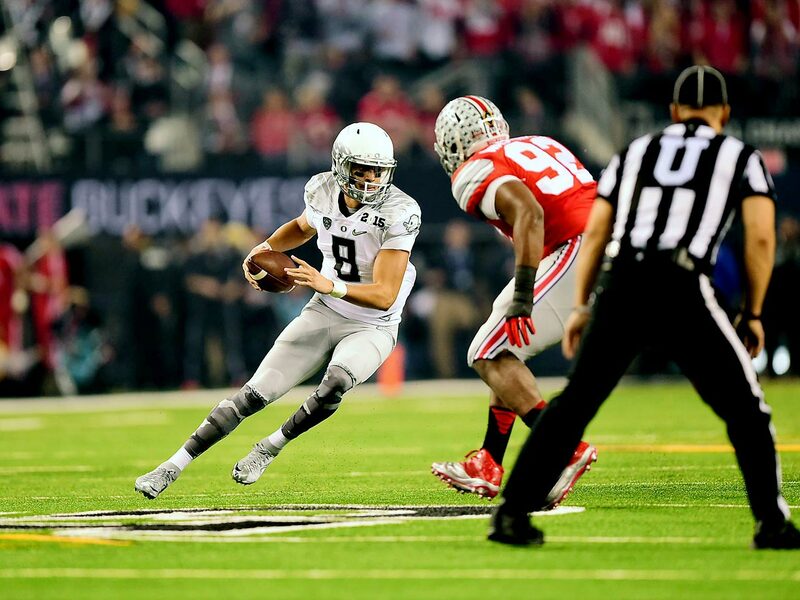 Despite getting four Ohio State turnovers, Oregon scored only 20 points. 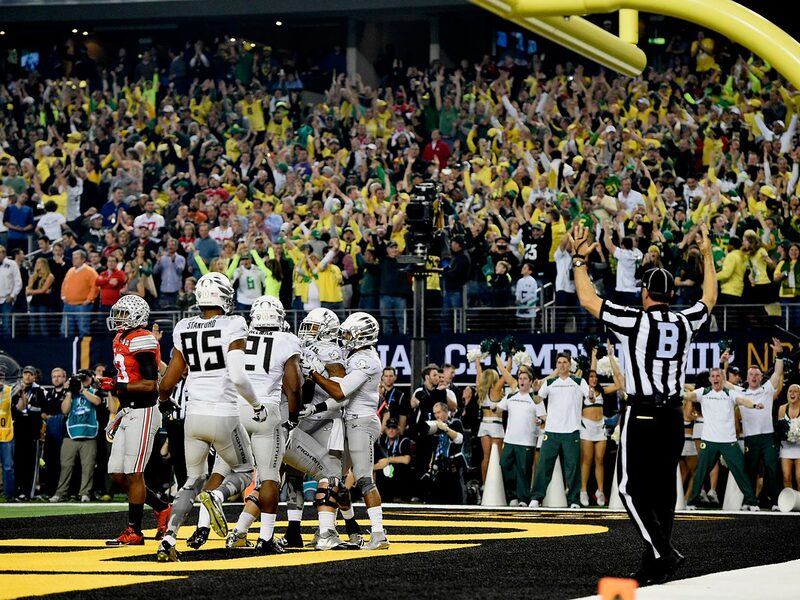 Oregon celebrates its first touchdown. 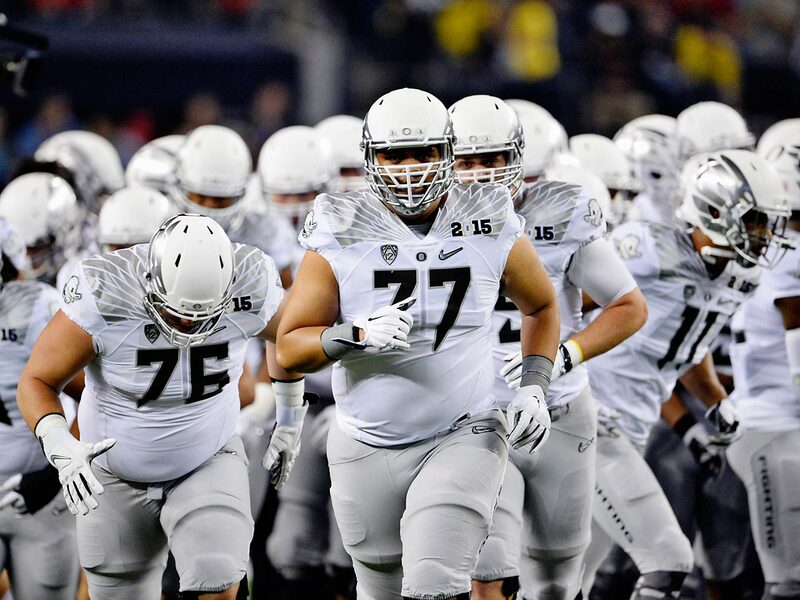 Oregon offensive lineman Hanitelli Louisi leads the Ducks on to the field for the National Championship game. Ohio State Buckeyes players line up across the school's marching band before the start of the National Championship game. 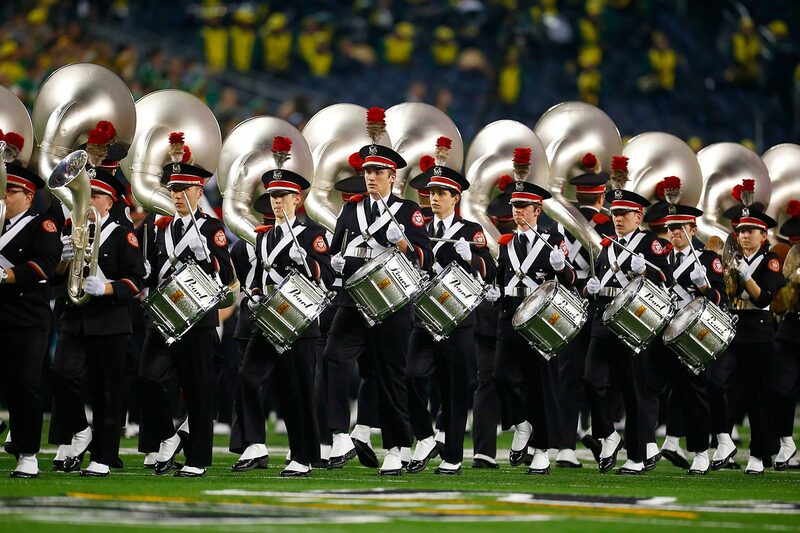 The Ohio State Buckeyes marching band performs. 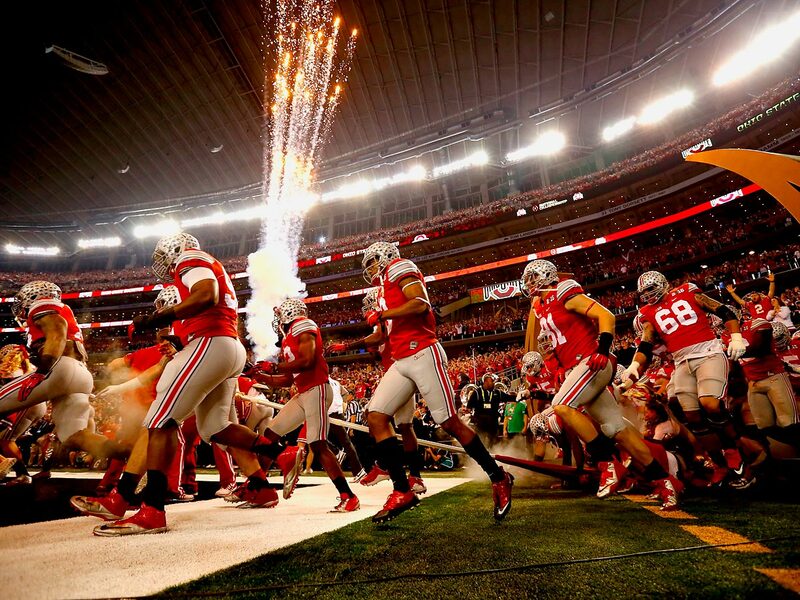 Ohio State players run out onto the field before the start of the first ever College Football Playoff National Championship game. 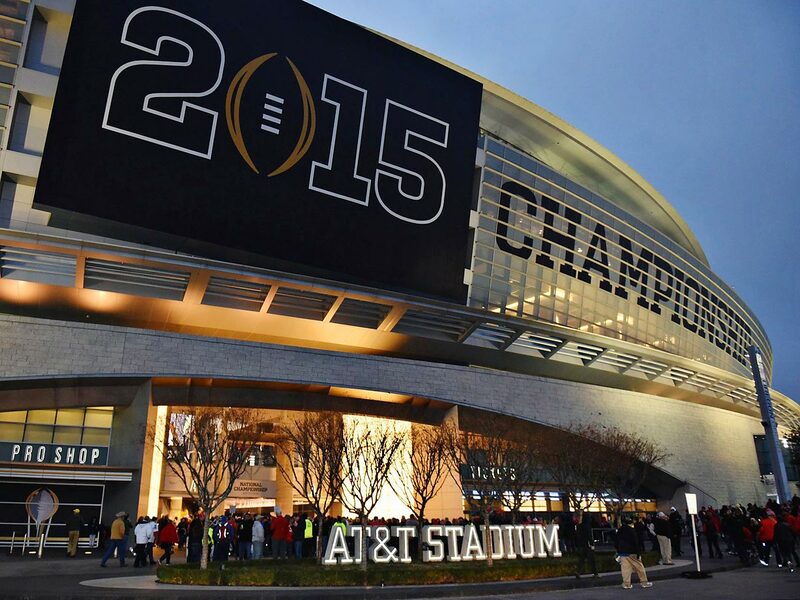 AT&T Stadium, home of the NFL's Dallas Cowboys, hosted the first final of the new College Football Playoff. The Ohio State marching band performs on the field during the first championship game.